A new study by the Tri-State Transportation Campaign shows that pedestrians over 60 years of age are disproportionately at risk of being killed in pedestrian collisions. 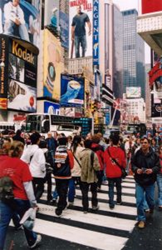 New York personal injury lawyer Kenneth A. Wilhelm says there are several safety measures older pedestrians can take to avoid these tragic incidents. Pedestrians aged 60 years and older in the tri-state area are disproportionately at risk of being involved in fatal pedestrian accidents, according to the results of a study released by the Tri-State Transportation Campaign. Based on the study titled "Older Pedestrians at Risk: A Ten Year Survey and Look Ahead," between 2003 and 2012, 1,492 pedestrians aged 60 years and older were killed on Connecticut, New Jersey and downstate New York roads. The study found that although people in this age group comprised only 18 percent of the region's population, they accounted for 35 percent of pedestrian deaths. The pedestrian fatality rate for the region's residents 60 years and older is 2.5 times higher than that of residents under 60. For residents 75 years and older, the pedestrian fatality rate is more than three times that of those under 60, the report states. The report recommends that simple roadway improvements such as clearly marked crosswalks, longer crossing signals and wider pedestrian islands can make walking safer for older pedestrians. Seniors face the risk of suffering catastrophic and fatal pedestrian accidents because they have decreased bone density and the inability to react quickly to traffic situations around them, said New York personal injury lawyer Kenneth A. Wilhelm. "There is no question that New York City's congested roads can be death traps for all pedestrians, especially our aging population." As far as possible, walk on sidewalks and walk facing traffic. Stop at the curb before entering the street. If possible cross only at street corners, preferably those with a traffic light and within marked crosswalks. Pay attention to "Walk/Don't Walk" signals. If feasible keep scanning for vehicles as you cross the street. Make yourself visible to drivers. Hold your hand up or make eye contact with drivers so you know they see you. Avoid walking in bad weather such as snow, ice, rain or fog, if possible. Make sure you have sufficient time to cross the street. If you feel you don't have enough time, wait for the next cycle. If you are in a parking lot, listen for engine noises that indicate a vehicle is backing up. Wear proper, well-maintained footwear that will provide support. For questions or comments please contact the Law Offices of Kenneth A. Wilhelm. Our New York personal injury attorneys can help victims and families with their pedestrian accident cases. We can also help with personal injury cases in New Jersey, Connecticut, Pennsylvania, or Florida.